Episode starts with Morgan out looking for Carol and sees a sign "You are Alive". He finds a horse that has a saddle. The surviving savor is looking for Carol as well and is following a path. We see a guy running and hear whistling. Carl and Enid are talking while Carl plans to leave. Flash to the guy running who is finally caught by the saviors. Rick is stocking the RV. Abraham, Sasha, and Eugene volunteer to go as well. (too many people leaving camp which leaves Father Gabriel in charge) Carl tells Enid to "Just Survive Somehow". Aaron agrees to go as well. Morgan is riding through town on the horse doing a search. He finds Carol and she has a wound on her side. The saviors drag the guy they were chasing to the street and say they will make an example out of him. Morgan treats Carol's wounds and says she needs stitches and antibiotics and that at dawn they will head back to get her medical help. Rick and crew come upon the saviors with the guy in the middle of the street. Rick and crew meet them in the street. Rick asks if the guy wants to make today the last day on earth. (there's a lot of extra talking going on) They get back in the RV and decide to go another way. Rick and crew see the guy from early being hung as they come to another roadblock of trees that get set on fire. They run back into the RV and take off. They park on a road and try to come up with a plan. Eugene points out that they are waiting for the vehicle and do not know who is in the vehicle. Eugene agrees to drive while the others take off. Inspirational speech between Eugene and Abraham. Rick and the rest of the group carry Maggie. They hear whistling and see the saviors in the woods in the dark. They realize they are being surrounded and take off running in the woods. They run into a clearing and find themselves surrounded and everyone is whistling. (my thoughts are if you are surrounded by that many guns then I rather die on my feet then on my knees. 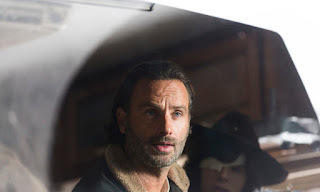 I am just going to start shooting and be done with it) Rick notices Eugene is captured. All of them are forced onto their knees. 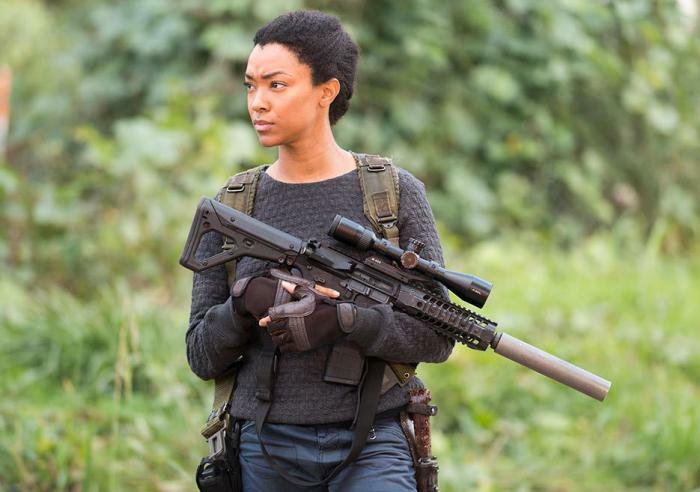 Dwight comes out and pulls out the rest of the crew from a van - Daryl, Michonne, Glen, and Rosita. (All their heavy hitters are out there - big dummies). Out of the RV steps the long awaited Negan ( the dad from Supernatural lost some weight). He points out that Rick will regret crossing him. Negan demands all their stuff or they will kill him. 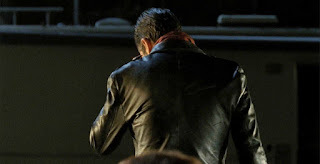 Negan points out that he works for him now and that he is not safe. He needs to do what he wants and that is the deal and his new way of life. 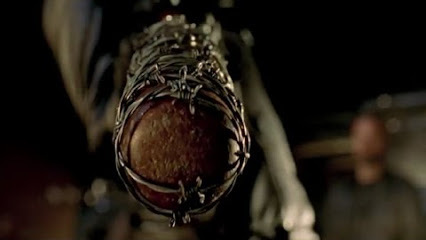 Negan says that they will have to pay for killing his people. He introduces them to Lucille, the bat. 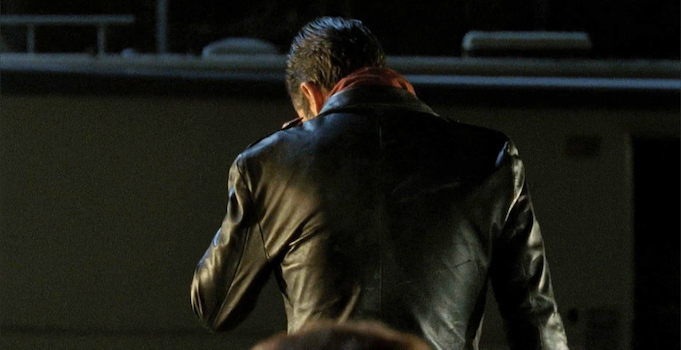 Negan walks down the line picking on each one. As he walks over to Maggie, Glen gets up and is beaten and dragged back into line. (that was very stupid on Glen's part). Negan called Carl a future serial killer (yay! just like the comics - I have been waiting for this line). Negan claims he is having a hard time deciding who he should kill. He does "Eenie, Meanine, Miniy, Moe" to decide who he will kill. He picks his victim and begins to smash their head in. Blood drips down and we hear the skull being smashed. Fangirl Thoughts: It is the comics come to life with a bit of things modified. Sadly the episode ends with someone's death but we do not know who exactly he picked. Raise your hand if you are pissed off and feel like this episode was a waste of your night. I mean c'mon! We needed to know who died. Now, we have to wait until October! Oh well, whatever - what are your thoughts? Agreed! They could have done better.